A Primary school has been forced to close due a fire at a warehouse attached to a mill in Bolton. Crews were called at 05:00 BST. Eight fire engines were tackling the blaze, at its height, involving up to 15 tonnes of carpet in Gilnow Road, Heaton. Greater Manchester Fire Service said Gilnow Primary School will be closed as crews deal with the incident. The fire has been brought under control, with 90 per cent of the building saved. People living nearby have been advised to keep windows and doors shut as a precautionary measure. Fire service says cannabis factory discovered at property in Grangetown area, after officers called to house fire. A firefighter who suffered burns to his back and shoulders while tackling a blaze a South Wales house which was being used as a cannabis factory has been released from hospital. The alarm was raised by a member of the public at 02:48 BST on Sunday morning. At the height of the incident, more than 40 firefighters from stations in Cardiff and Barry fought the fire. South Wales Fire and Recue said they discovered the cannabis factory on the upper floor of the house. 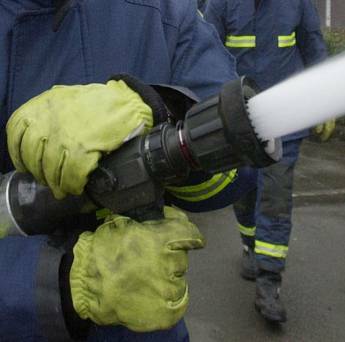 A fire service spokesperson said the house was well-alight when the fire officers arrived. South Wales Police said neighbouring houses were also evacuated for a time. Clare Road was closed for 12 hours but has now reopened to traffic. The fire service said the fire fighter has been discharged from hospital. Emergency services were called to the old Torryburn Hotel in Kintore shortly after 23:00 on Thursday. Five appliances attended the blaze and battled the flames that tore through the building, the Scottish Fire and Rescue Service said. An investigation into the cause of a fire at a disused hotel in Aberdeenshire has been launched. A total of 45 firefighters were involved in tackling the fire, using a specialist height vehicle and thermal imaging equipment. More than 70 firefighters are tackling the blaze over a seven-acre area at the Smurfit Kappa paper mill in the Nechells area of Birmingham. 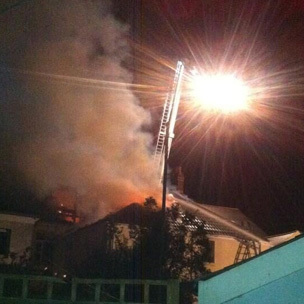 The fire had started just after 10pm on Wednesday night. Tens of thousands of tons of cardboard is expected to keep burning for days at the recycling plant. There are 20 fire crews on the site and at one point overnight 100 firefighters were on the scene near the M6 motorway. The site in Mount Street is a recycled packaging mill, according to the company website. According to its website, Smurfit Kappa is one of the leading producers of paper-based packaging in the world, with more than 41,000 employees in 32 countries. It has its headquarters in Dublin.